Last Wednesday morning at about 3 a.m., a fire broke out at the corner of Santa Barbara and De la Guerra streets in an apparent attempt to snuff out the soul of our downtown art scene. Three cats-including neighborhood celebrity Danny de la Guerra -were killed, an apartment full of one couple’s personal belongings was ruined, and that couple had to escape the building while screaming through thick, black smoke. (Another inhabitant also lost everything, though his allegedly unpermitted living space is said to be where the fire began when a lamp ignited a blanket.) Meanwhile, as the Fire Department fought the flames, David Court and Christi Westerhouse, the owners of The Frameworks/Caruso Woods Gallery, dodged flames as they tried to save valuable pieces of art. 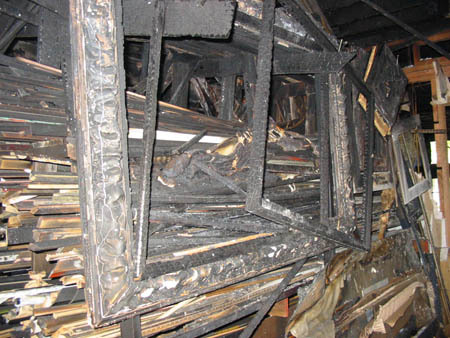 Last Thursday, surveying The Frameworks carnage -where the walls drip with black soot, the framing shop sits charred, and an outline of Danny’s last stand remains on the floor-David Court, whose wife and business partner, Christi, is pregnant, explained, “We weren’t doing what we were doing to sell the art. We were doing it to allow a lot of young people without money to be involved in the artistic process. We were doing it for the community-building aspects.” With black soot on his hands and a tremble in his voice, he said that he doesn’t know what they’ll do next, but hopes they can remain in that spot.